It's small, it's speedy, it's simple to use – but is this nifty Nikon worth your time? Using the diminutive Nikon D5600 is a world away from shooting with a bulky enthusiast SLR like the D7200 or D500. It’s light and unobtrusive, but its image quality is terrific, and the vari-angle screen makes it supremely versatile. The SnapBridge experience is disappointing, though, and prices might have to drop a little for the D5600 to be tempting. 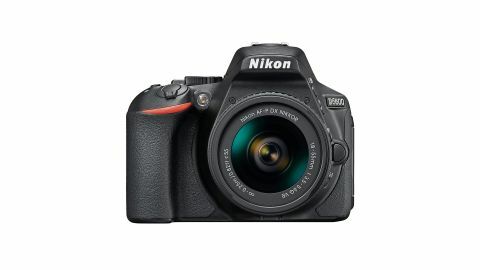 The Nikon D5600 is a recent member of the Nikon’s D5000-series camera club. The D5600 is one step up from the new entry-level D3400, filling the space between that model and the more enthusiast- and pro-orientated D7200 and D500. In one vital respect, though, it’s one up on all of them. These D5000-series cameras are the only DX-format Nikon SLRs with a vari-angle screen. The range's combination of novice-friendliness, vari-angle screen and small size make it ideal for both first-timer camera users and photography students. The key new feature in the D5600 is Nikon’s wireless SnapBridge technology, where the camera maintains a low-power Bluetooth LE connection with your smartphone or tablet. The D5600 is almost as small and light as an SLR-style mirrorless camera, yet the grip is deep and well-sculpted, so that you still feel as if you’ve got a proper hold. Some of the buttons are oddly small, though. This doesn’t affect their operation, but the icons are a little harder to read. The new AF-P 18-55mm lens transforms the camera’s Live View performance. It’s still not as fast as a mirrorless camera, but the speed and responsiveness of the Live View autofocus is certainly unexpected – and it works really well with the screen’s touch control. You can just tap an object in the scene, and the camera will focus on that object and take a picture in a single action. The SnapBridge system is less impressive. It worked fine, if slowly, with a Android smartphone, but the iPhone operating system insists you select a Wi-Fi connection manually. The D5600’s autofocus, white balance and exposure systems worked well. Most of the time you can leave the camera to work out the correct settings and it’ll do it reliably. The camera’s fine detail rendition is especially good and, unlike a lot of kit lenses, the new AF-P 18-55mm holds its sharpness right to the edges of the frame – and at longer zoom settings, too.